The Bagpipes. What are those bagpipe parts called? And where are they? 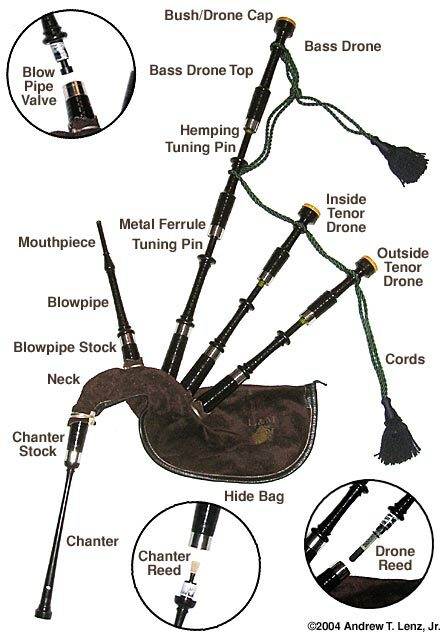 Since I keep getting asked how these things go together—you really should wait for your instructor before starting to play your pipes—I've put together breakdown of the various parts of bagpipes. The above is my set of African Blackwood bagpipes (without a bag cover) and the diagram should be self-explanatory, though a few comments follow. The blowpipe valve shown is a "Lil' Mac" plastic and rubber valve, traditionally this would be piece of circular leather with a "leg" that is tied into place at the base of the blowpipe. There are other valves on the market which are less restrictive to airflow than the Lil' Mac. The valve keeps the air that is blown into the bag by the piper from returning back out of the blowpipe. Though rare, some pipers forgo a valve and use their tongue to block the air and keep it from escaping. Bagpipers press harder on the bag while taking a breath to maintain the same internal air pressure which seems the sound from wavering. The drone reed shown is a Kinnaird Carbon Fiber Drone Reed—a brand and type I happened to be using at the time of the photo. Traditionally the reed would be made of natural cane which would resemble bamboo. (For more on types drone reeds, see Identifying Drone Reeds.) There are three drone reeds used in a set of bagpipes: two tenor drone reeds, and a larger bass drone reed. The chanter reed is double reed (two matching pieces secured together) made of spanish cane, and though yet to gain popular acceptance, some are made of synthetics. The chanter reed is critical since the melody for a musical piece ("tune") is played on the chanter. If a drone reed fails, the music can go on, but not so for a chanter reed. The bag shown is an L&M brand (cow) hide bag. Sheepskin bags are also used (good for those pipers needing excessive moisture to escape the bag quickly), as well as Gortex bags and hybrid bags (hide outside with synthetic inside). Sometimes bags can even be made of kangaroo hide! The white material on the joints—shown in the circle images—is Teflon tape and is used by many pipers (certainly not all or perhaps not even most) for fine tuning the seals of the various joints on the bagpipes. The joints of a set of bagpipes are wrapped with a string-like material called "hemp" though these days it's almost always made of linen. The hemp can be waxed or unwaxed and is commonly found to be either yellow or black in color. There are four tuning pins found on a set of bagpipes, one on each tenor and two on the bass drone. The pitch of the drones is adjusted by shortening (higher pitch) or lengthening (lower pitch) the overall length of the drones. The drones are adjusted to match the pitch of the chanter reed's pitch. There are ferrules which are rings found around the various connection points on a set of bagpipes and can be made out of metal, plastic, ivory or horn, and sometimes even palm nut. Ferrules provide additional support to the wood at stress points and help prevent splitting. The bagpipe drones, stocks and chanters are most commonly made out of African Blackwood, an oily dense wood commonly used for musical instruments. Bagpipes are also made out of ebony (though fallen into disuse due to propensity for cracking), cocobolo, and sometimes other hard woods. Since the latter 20th Century, bagpipes have also been made out of plastic. That should just about cover everything! For some history about my set of bagpipes and detailed pictures with descriptions see More about Andrew's Pipes. This page last updated Thursday, June 23, 2011. Page first created in February 15, 2004.